Brian Nichols’ lifelong dream was to retire to the Italian countryside where his ancestors once lived. But his wife, Susan, was not convinced. So in 1995, the South Florida couple toured Western Europe for more than three months searching for a place to spend their retirement years. After seven weeks in Italy, including time spent in the Marche region, Susan finally consented to Brian’s ultimate fantasy and agreed to search for a home in Italy. Marche region from Umbria. There is a comfortable living room to accommodate guests, and a spacious side apartment for the Nichols to seek their own solitude. However, the Nichols made drastic renovations including new flooring, electrical wiring and a new plumbing system. 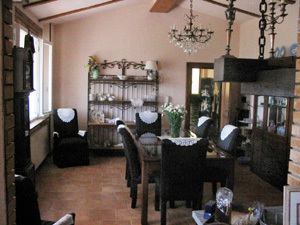 Their typical Italian kitchen was remodeled for Susan to cook for herself and her husband, as well as preparing delicious breakfasts for her guests. Since their adjustment, they now find themselves using this time the way the Italians do and find time for longer lunches, afternoon naps, painting and cleaning. The Nichols find that Cantiano offers most everything they need for their daily lives. They have made some friends and have improved their language skills by taking Italian classes at the Atrium, an Italian language and culture institute in Cagli. Occasionally, they travel to neighboring cities — up to an hour away — to purchase necessities. The Nichols said they miss their family and friends left behind in the United States. However, their lovely home provides much incentive for their family and friends to visit Cantiano and experience the life the Nichols’ love. 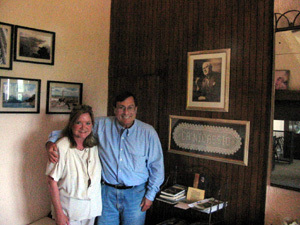 Ca’ Nicassio, named after Brian’s grandfather, has received guests from all over the world. 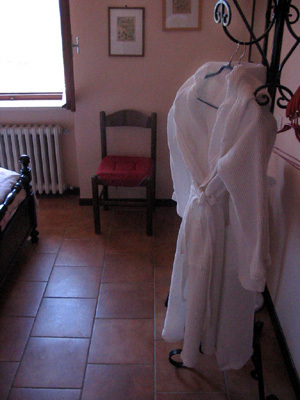 The bed and breakfast, operating from Easter through October, costs only €25 per person per night, including a filling breakfast with local meats and cheeses, yogurt, cereal, pastries, coffee, and a hot specialty dish homemade by Susan. 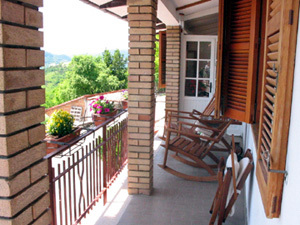 The Nichols purchased their white century-old home with traditional red roof just two years ago and now operate a bed and breakfast for those who would like to escape from their busy everyday lives and relax in the serene Italian countryside. Originally, they were attracted to Urbino, the well-restored Renaissance town that Brian, 60, calls a “marvel to the eyes.” But after searching for a year while real estate prices skyrocketed around Urbino, they decided to look elsewhere. 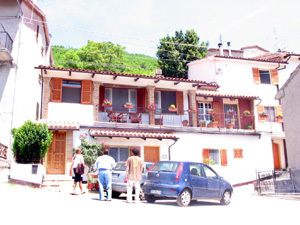 At the suggestion of a realtor in the nearby town of Cagli, the Nichols stumbled upon their treasure in Borgo di Palcano, a small village within the Cantiano district. Nestled on top of Monte Petrano in the virtually untouched Marche region, their home is a treasure hidden from both local and tourist eyes. 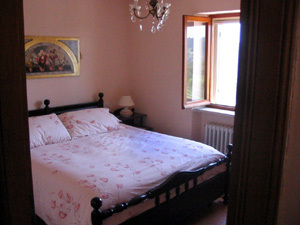 The Nichols agree that they enjoy everything about the Italian lifestyle. They enjoy the interaction with the friendly people of Cantiano and have learned to slow down and enjoy what the area has to offer them. “Life is sweeter here, and every moment is savored,” said Susan, 54. After working as a car salesman for 36 years, Brian found himself continuing his very structured lifestyle for the first six months of his time in Italy. The Nichols were not accustomed to the less hectic lifestyle and did not know what to do with their time from the hours of 1:00 p.m. to 4:00 p.m., when all the shops close down during pausa, or afternoon break. Brian and Susan run the bed and breakfast without relying on any other wait staff. Cantiano and other nearby towns offer an array of activities for the guests of Ca’ Nicassio, including multiple hiking trails, horseback riding and mountain biking. 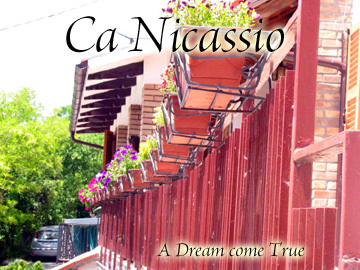 Ca’ Nicassio also offers wireless Internet access, a gazebo with a grill, and a nice terrace for relaxing with a glass of wine and enjoying the serene landscape.